A.D. & C.M. Holt-Wilson01291 690428work Shop - FarmWe have been rearing fresh turkeys for Christmas on our farm in Raglan since 1988. We progressed from barn reared White, to Free Range and then in 2000 to fully Organic Bronze Turkeys. 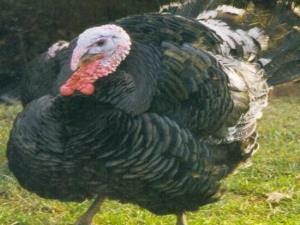 The turkeys are grown slowly over five and a half months when they are free to roam by day in the fields and woods. In the evenings they are rounded up with our sheepdog and housed. Apart from this contented existence we believe the excellent meat quality is affected by additive free feed and stress free slaughter on the farm. We dry pluck which allows them to hang for a minimum of seven days to enhance their texture and flavour. We have been rearing fresh turkeys for Christmas on our farm in Raglan since 1988. We progressed from barn reared White, to Free Range and then in 2000 to fully Organic Bronze Turkeys.